As children we always loved to paint and let loose the imagination of our own colourful world. As we grow, often life’s experiences turn those vibrant colours into the various shades of grey. Things were no different when we were children than what they are now. The only difference is the conditioning mindset that has evolved over time to develop a certain perspective or attitude that has made us the way we are today. The good news is that God has given us the ability and power to choose how colourful and vibrant we would want our life to be or become. Marking the 100th post of Sweet’n’Savoury’s food blogging journey we let our imagination loose to create, like a painting on canvas, a vibrant and colourful Savoury dish ‘The Ocean Platter’. 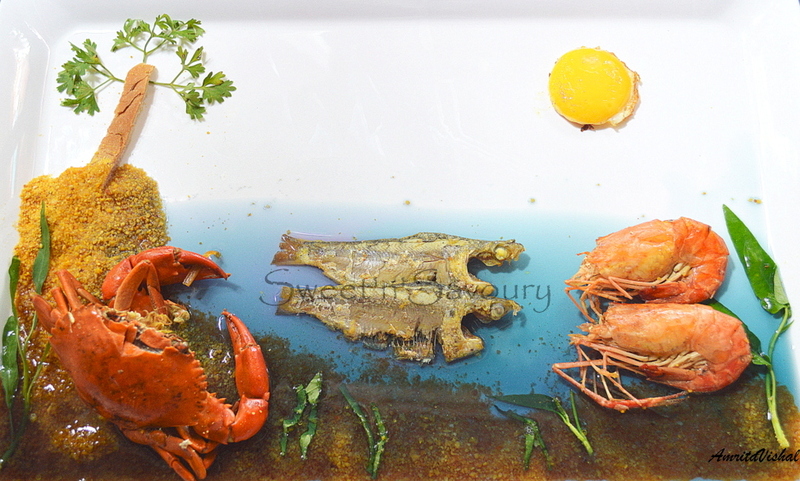 Amrita and I had conceptualized this food painting idea many days ago and were working out each element one by one. The dish had to be a colourful savoury with everything on the platter to be natural and edible. The enormous task in our hand was creating the blue ocean without using any food colour and one that had to be savoury in nature. For many days we just could not think of anything in this world that would give us a blue extract. No food, vegetable or fruits we could think of could come even close. Moreover, the blue colour in the culinary world is considered to be an appetite depressant. This blue didn’t just have to be vibrant to represent the ocean but it had to be savoury enough to give an appetizing outlook to it. After much brainstorming my Dessert-Queen, Amrita, found out an ingenious way to create the blue savoury sea. Contrary to our assumption, creating the blue ocean was one of the simplest elements in the Ocean Platter. The Ocean Platter surely does require more refinement and we are hoping to enhance and inculcate more flavours and techniques into it. We hope that our innovation inspire more food enthusiast in the culinary world to experiment an out of the box thinking food grammar and push the food imagination envelope even further. 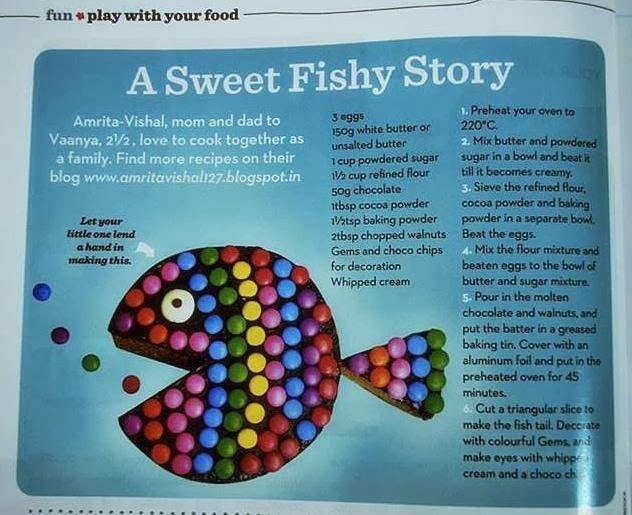 For Amrita and me, it has been an incredible food journey on Sweet’n’Savoury where our lives has been so much enriched by the experience, friendship and passion shared by fellow bloggers. The Ocean Platter can be as versatile as possible as the accompliments can be served outside the presentation. Try not to disintegrate or de-shell the sea food as the rich red colour that comes from it is absolutely important for presentation. However it is very important to try to slit the shell at the back of the prawns to devein it. You may also just cut off the head of the prawn but leave the overall body and shell intact. Likewise, you can have the crab cleaned the usual way except for leaving the whole body intact rather than breaking it up. Ensure to reserve the hood of the crab just for presentation. You may include an assortment of as many sea fishes as you like. Since this was just an experiment I decided to try only three. You may cook the sea food the way you want. Throwing it in seasoned boiling water is a great way to cook them through and through specially when their entire body in intact. You may season the water with strong spices such as bay leaf, black peppercorns, garlic, etc and herbs such as parsley and chopped onion with salt. Alternately you can also marinate the sea food and pan fry it. The sea bed and the sands are crushed bread toast. Using real bread crumbs is more advisable as you can inculcate all types of flavours. The tree is the side crust of a regular sliced bread and its branches is the parsley herb. The sun ofcourse is the yolk of an egg. The green weeds are combo of any salad leaves. I used one called water Ipomia. Now for the blue colour- Amrita found an amazing blog by Jojo at http://eyecandy.nanakaze.net where they shared how to extract the savoury blue. It comes from boiling the purple cabbage. and adding baking soda, The amazing thing was the purple cabbage that we boiled directly gave us the blue extract. I did season it with salt but on a test batch I tried to mix in the cornflower to increase the consistency of it. However the brilliant blue became pale blue. On the platter I have reduced the liquid but it still remains a bit running. We shall be working on it to get the right consistency. Hello lovely, loving and talented bloggers! Your passion for cooking, your presentation and creativity leaves me spellbound. I actually took the first picture of your platter to be a painting till I read your post. The Sun looks stunning. Bread crumbs have given such a natural look of the sand. Water looks so real. Cooking is an art and presentation makes it more appealing and attractive. You have mastered this art so well. Congratulations for your 100th post and wish you many more milestones in times to come. I am speechless! The entire platter looks colouful! and replicates ur talent and passion towards culinery field. My hearty wishes for ur 100th post, congrauts!! Oh wow that ocean platter is so beautiful! And Congratulations on your 100th postings! take a bow. am speechless o at your creativity. 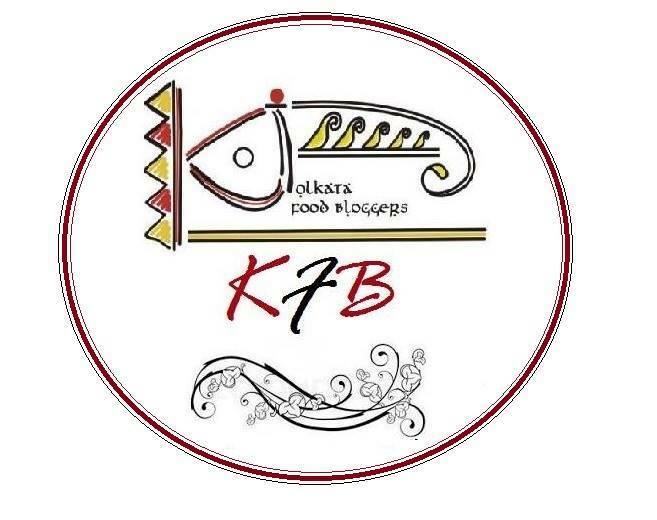 this is super gorgeous and shows your love for culinary experiments...happy 100th and expect to see many more such innovative recipes. Its a stunner and inviting dish, especially the crab. Congrats on your 100th post and surely am looking forward for more delicious recipes in your space. Thank you so much for your appreciation...and wishes..! congrats and many more to come. you are such an artist and creative mind. Bless you. Hi Amrita & Vishal.... I'm very impressed with your culinary skill. This is really EXCELLENT! I love love your ocean platter, impressive. Congratulation on your 100th post, may you continue to share many more 100.... in the future. Thank you so much for your wishes....loved your blog...just a question..on your recent post there are lots of croc pics..do you have a fascination for them?